Every room in Adare Manor is worthy of the Dunravens’ grand legacy of beauty and luxury. Every decision has been made with your comfort and enjoyment foremost in mind, something that will become immediately obvious the moment you step across the threshold. Individually designed and beautifully furnished, full of personal touches and carefully considered details, your room is the perfect retreat, a place of ease and repose where you can reflect on the joys of the day and anticipate the pleasures of tomorrow. With inviting beds, gorgeous historically-inspired art and furnishings, marble en-suite bathrooms, and beautiful views from every window, your room was carefully crafted for indulgence and relaxation. Our Deluxe Rooms are the perfect choice when you want to give yourself a little more room to enjoy the indulgences of life at Adare Manor. With 538 square feet/50 square metres of space, you can feel your spirit expand as soon as you walk through the door. A glance out of the window is rewarded with an awe-inspiring view: the graceful French Gardens, the flowing River Maigue, vast greens of our championship golf course, the tranquil Beechwalk, or the elegant Courtyard. Turn your eyes back to the beautiful sights inside, and you’ll know you’re somewhere very special. From the marble en-suite bathrooms with rainfall showers to the lovingly-chosen artwork, from the gorgeous Georgian-inspired furniture and welcoming king-sized bed, to the generously stocked mini-bar and luxury toiletries, everything here has been hand-picked to ensure that you can relax in an ambiance of beauty and comfort. 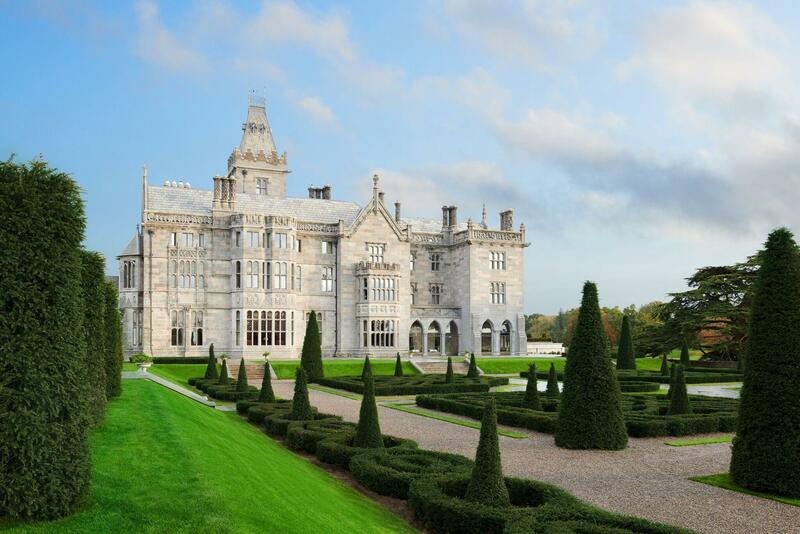 Once you arrive at your 1 Bedroom Suite at Adare Manor, you’ll know you’ve come home. Every exquisite detail of this place sings of elegance, comfort, and indulgence. Spread across 926 square feet/86 square metres, you’ll find everything you need for a deeply relaxing stay with us. Lounge in your gorgeously furnished private sitting room, graced with Georgian-inspired furniture in warm mahogany wood, and enjoy refreshments from the well stocked minibar, refilled daily with our compliments. Gaze at original etchings and oil paintings from the 19th century, each specially chosen to compliment the rich colours and textures of the space, or take in the expansive views of the gentle River Maigue, the gracious courtyard, or the impeccable rolling greens of our championship golf course from the huge windows. The grand marble bathroom with double vanity invites you to refresh yourself under the rainfall shower or pamper yourself with a relaxing soak in the depths of the welcoming separate bath. In the perfectly appointed bedroom, a luxurious king-sized bed beckons, promising a deeply refreshing night’s sleep. This is a place where you can slow down and savour the finer things in life. With an expansive 592 square feet/55 square metres of space, your Stateroom invites you to stretch out and revel in the grandeur of your surroundings. Outside the windows are glorious, restful views: from the gracious symmetry of the French Gardens to the rolling parkland of our championship golf course, the hushed majesty of the Beechwalk or the dignified elegance of the courtyard. Inside, the old-world opulence of our magnificent Staterooms is apparent in every individually chosen detail. Furnished and decorated in keeping with the gracious history of Adare Manor, these rooms boast mahogany furniture inspired by the Georgian period, impressive fireplaces, luxurious textiles and original oil paintings and etchings from the 19th century. A comfortable sitting area within your room invites you to linger and enjoy the beauty of your surroundings, with an elegant desk for correspondence. Lavish marble bathrooms with a double vanity, rainfall shower, and separate inviting bath, a spacious king-sized bed, and a minibar stocked with our compliments create an indulgent atmosphere designed for relaxation. Complimenting the dining spaces at the Carriage House is the Carriage House Bar. The social hub of the estate each evening, guests will be attracted to this lively, smart bar featuring light fayre, bar snacks and a wide range of fine wines and cocktails with fireside seating. The Carriage House Grill will be a venue that offers the complete package, a carefully considered experiential destination for dining and events. A warm and welcoming environment with unrivalled service that showcases the best in artisanal and local produce, prime Irish dry aged beef and fresh fish. From striking sunset dinners to a tranquil nightcap before bed, sit back and relax in The Carriage House restaurant’s incredible terrace for al fresco dining. The only thing better than the view, is the truly delicious food served to perfection in this more informal atmosphere. Taking centre stage is an impressive open kitchen giving an opportunity to watch the chefs “in action” preparing every dish to perfection. Adjoining the luxurious Drawing Room, guests can enjoy traditional and innovative cocktails or take an aperitif as a prelude to dining. Carefully crafted cocktails inspired by the history and architecture of the Manor House will provide a unique experience. Overlooking the lush formal gardens and exuding warmth and style, the Drawing Room is an ideal spot to meet for morning coffee or to enjoy light meals and refreshments throughout the day. The Gallery simply has to be seen, to be believed. Inspired by the great Hall of Mirrors in Versailles, the Gallery is 132 feet long and 26.5 feet high. While 17th century Flemish choir stalls tower magnificently over all who pass beneath them, the walls are beautifully decorated with hand-carved biblical scenes, situated opposite enormous open marble fireplaces. This magnificent room is home to the grandest breakfast and afternoon tea room in Ireland. Perfectly cut sandwiches, an extensive selection of blended and first flush teas and the most delectable hand-made pastries and scones, all presented to perfection by a team of dedicated waiters, make our famed Afternoon Tea a truly exquisite occasion. The Oakroom sets the standard for culinary excellence in exceptional surroundings. Intimate and lit by candlelight, this truly magical setting overlooking the River Maigue is the perfect accompaniment for an unforgettable fine-dining experience. Specialising in the very best seafood from sustainable sources and prime Irish meats and game, experience our exquisite cuisine within the lovingly restored oak panelled dining room. Journey through our extensive wine offering, or relax in the knowledge that our Sommeliers wine pairings accentuate the contemporary cuisine from our signature restaurant. The Tack Room bar is the perfect place to get lost for a while. Filled with The gentle notes of our live piano, the friendly chatter of fellow residents and the Clinking of glasses as people raise a toast to good fortune, the Tack Room is the place To make new friends or just get lost in each other’s company. Throughout the evening, guests can enjoy a selection of creative sharing platters and light bites that pair well with the bar's wide array of rare Irish whiskeys, or the assortment of craft beers and specialist cocktails. The Tack Room hosts the finest local musicians playing the best traditional and contemporary Irish music. A visit to the Tack Room can easily stretch into the early hours. The perfect retreat for fine spirit lovers. Head northeast on N19. At the roundabout continue straight to stay on N19. At Drumgeely roundabout, take the 2nd exit and stay on N19. Exit the roundabout onto N19. At Shannon Town roundabout, take 2nd exit and stay on N19. Exit the roundabout onto N19. At the roundabout, take the 3rd exit onto the N18 ramp to Limerick / Bunratty. Exit the roundabout onto the N18 ramp to Limerick / Bunratty. Merge onto N18. At junction 1, use the 2nd from the left lane to take the M20 exit to Cork / Tralee N 21. Keep right, follow signs for M20/ Cork / Tralee/ N21. Keep right to continue on N21. At the roundabout, continue straight to stay on N21.